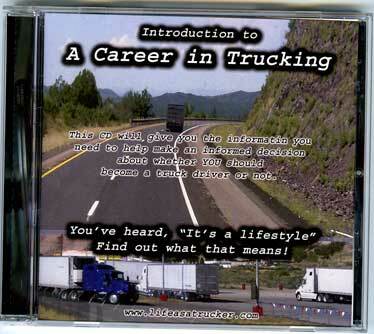 Choosing a trucking company is tricky especially for new drivers. Your options are more limited and you and you may not know what to look for. Let's start with what to consider before adding trucking companies to your list. Trucking companies will list most of their preferences with regards to the information above. As a new driver your choices will also usually be limited to pulling dry van, flat bed, tankers or refrigerated loads. Specializing further will usually require you to be an experienced driver. You should take a look at the options available to get an idea of what you might want to get into in the future. If possible consider driving for a trucking company that has those positions available also. For instance, if one day you want to do heavy haul, try pulling flat bed for a company that has heavy hauling division. OK. 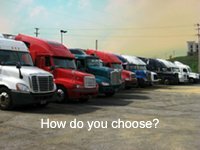 Lets get to the nitty gritty in the next phase of your process in deciding how to choose a trucking company. Being proactive by asking these questions will help to turn your trucking job into a trucking career that makes you happy as soon as possible. Have a plan to reach your ultimate goal whether it is to be a local driver or haul specialized freight. There are too many truck driving jobs to start off at one that doesn't meet some of your needs and you end up as an unhappy driver. (Keyword is some. It will be hard and in most cases unrealistic to find the perfect company that has everything you need. You have to find the one what is right for you based on how you prioritize your needs. Once you eliminate the companies by what they offer, (or don't offer) then you need to talk to drivers that work for the companies you are seriously considering if possible. Make sure what they (the drivers) are saying about the company is the same thing the company recruiter is saying about the company. Things that don't match about a company you like, call the recruiter back and question him on it. You know, the things that matter to you and your specific needs, pay, home time, lay over pay, rider program, insurance benefits, etc. What may be most important to one driver, may not be important to another driver. If a retired vet wants to drive simply to travel the country for free or complete a childhood dream, he may buy a truck without concern with building wealth on the back of trucking. But he already has medical benefits and a check coming in. So he might be more concerned with where the freight carries him not the insurance or retirements benefits of a company job. A family man may need to get home every two weeks so the home terminal and travel lanes are important to him. Benefits may be more important to him/her than just pay for mile. Buying a truck is a huge risk without a good amount of money set aside. On the other hand, a single young man, might care less about the benefits, instead the highest pay may be more appealing. He doesn't care about home time so he wants to run coast to coast and stay out for months. His selection of companies will be different. So I have provided some things to compare company for company to see which one meets your needs the best. Remember, no company will be perfect for everyone and most likely not perfect for you. However, you are more likely to make a better decision if you put some type of system in place for choosing. Which is why you should use the questions listed that is important to you as a rough guide. Now if reality happens to work against you and you can't really get what you want in a company as a new driver, you will just have to deal with your options until you get that year in. Your options after that point will increase dramatically if you keep your record clean. Trucking companies need good truck drivers bad. Want to Get Home More Often? One of the best tips I can give you, is to choose a trucking company with a terminal near your home. This may help you with your home time arrangements. Another option would be finding a trucking company that has freight that brings them near by where you happen to live. For instance if you live in Oklahoma City, St. Louis, Columbus Ohio and many other places, whether there is a terminal there or not any large trucking company (and most small ones) can find freight that would get you home and likely already goes through those cities.